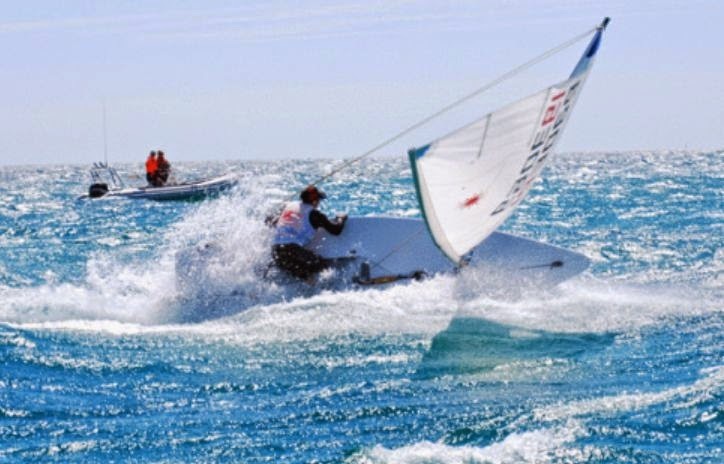 In the post about Laser Mainsheet Snags, comments were made about how Steve Cockerill's video suggests letting the boom out to initiate a heavy-air-gybe. I commented that surely letting the boom out would not work because it would be too unstable. The boom is waaaaay too far out. But even a little out makes things unstable. Then one of the sailors that Steve sponsors said this comment was correct and the reason for letting this boom out was to intentionally make the boat unstable. We're in strong wind on starboard and want to gybe. Almost all top-level events are held in open water, so there are probably big waves - a tricky situation. Steve suggests letting the boom out which is how you invite a death roll and swim (the twist at top of the sail is pushing everything to windward). The center of effort is now to the right of the boat which now wants to bear off. This initiates heavy air gybe with little or no rudder movement. I have never tried or even seen this, but it's brilliant!! Except for one problem - it's a controlled heavy-air-death-roll-that-ends-up-in-a-gybe. Steve is a better man than me because my priority for a heavy-air-big-wave-gybe is getting the boom across without tipping. This brings to mind comments from another world-class sailor. 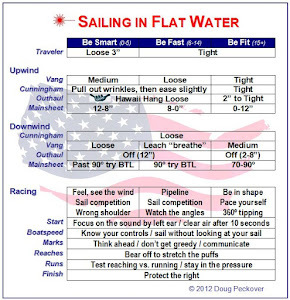 Several years ago, there was a Sailing World cover story article by Frank Bethwaite about how you bear off in a strong gust rather than the more intuitive heading up. Trying to head up in a strong gust. Frank called this 'steering for balance' and it was controversial at the time, with lots of people saying that Frank was wrong. Frank was, of course, correct. One of the key points Frank made was that by turning sharply in a gust, the boat wants to 'trip' over the centerboard. And the higher the speed, the more the importance as you lose control from the pressure in the rig. I learned this by accident about ten years ago practicing on a local lake in a 30 knot breeze. With each gybe, the boom would slam across and there was a huge pressure on the rig and in the steering as I tried to get the right balance again. We've all had this problem. So I tried something different and for me, counterintuitive: as the boom slammed across and I was on a new tack, I bore off to head straight downwind - steering for balance. The helm went neutral and everything worked beautifully, even in 30 knots. So here's a combination to try when it's really honking - sheet out a little to start a gybe, let the boat bear off on its own, and as the boom slams across, bear off sharply to neutralize the helm. 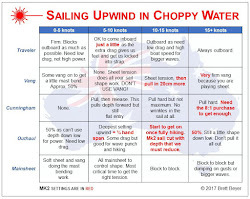 Oh and Ute, try to not wrap your mainsheet around the end of your boom! In the 90s, the Worlds courses included a gybe mark and in a breeze it was referred to as the graveyard because so many boats would tip at the mark. My practice sessions would include gybing at a certain point in a breeze and not waiting for lulls. The goal was to have enough practice and confidence to gybe at any time while maintaining control at all times so that I could maneuver around boats that were scattered in the graveyard. That era inspired Laser sailors to practice and perfect various techniques. That's the key ... pick a technique that works best for you and then practice it until you're comfortable. I totally agree with your final point. There are so many different ways to gybe and we all have different trade-offs between stability and speed. Great post. I think a lot of this stuff is about learning to do some things that feel very unnatural the first few times you try them. Steve recommends easing the sheet only about 2 feet, just enough to create instability, so the boat bears off naturally. You then follow this bear away with your rudder, which also has the effect of pushing the end of the boom towards the water, or flattening the boat. This makes the bear away feel remarkably stable through the turn. Once you are well by-the-lee, reversing the rudder triggers the boom to cross, meaning you decide when the gybe actually happens (unless you leave it much too long). This is, in effect, the bear away you are talking about, except that you turn the rudder before the boom has crossed. It all means that the exit is smooth and stable, and you don't get the "hanging-over-the-gunwale-with-the-boom-dragging-in-the-water-praying-not-to-capsize" look. I'd love to say that it has been the end of my worries at the gybe mark, but I still have the capacity to get it very wrong. But when I think back, it is always because I haven't followed the process, not because the process didn't work. Doug and Damian pretty much nailed what Steve and many of e top guys do. If you can pull it off every time you're Slingsby! I gybe as per above. One extra advantage. You end up with a slightly under sheeted sail. Not stalled and pushing you over. I think that gybe is a 'theoretically good' gybe. That is, one is which the boat wants to roll to windward to begin the gybe for you with little rudder input. But in wind and waves, it's best to use the rudder a lot to flick the boat into a fast gybe whilst remaining flat. It will then be more forgiving on the exit if you happen to be a little underpowered (too deep) or overpowered (too high). Boat speed and boat flat is what the good guys aim for! 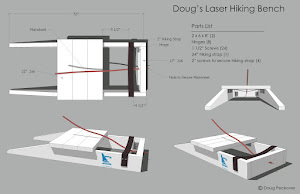 Doug, thank you very much for this post! Next time I have the chance to sail in strong wind, I will try to follow your advices. But whether I will be able to also control my main and keep it from snagging if it wants to, I don't know! It sometimes develops a will of its own. PS: Looking forward to meeting you in Hyère. Thanks for all the comments - it's interesting that after sailing a Laser for so many years that there are still things to learn. One topic that I have never seen for when it's really windy: how to change hands before the boom slams across. Changing after can be really tricky if the boat is not properly balanced. There is a way to do this that I discovered by accident 10 years ago - I'll try to a post video. Pam and I are looking forward to seeing you Ute along with everyone else in Hyère. Hi just one thing – only let the boom out to initiate gybing if you are on a reach.. If you are running – take yourself to a reach first!